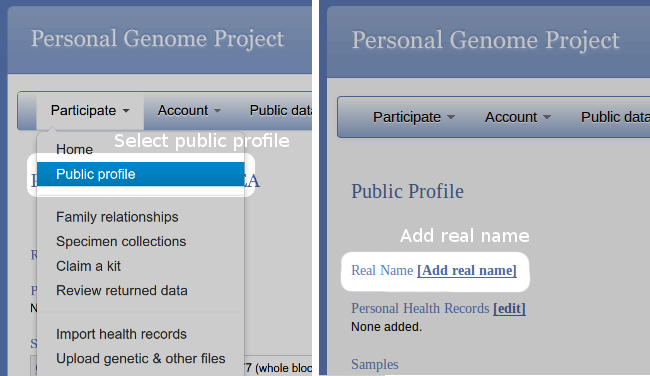 Some updates about PGP Harvard: (1) we’ve added a new feature to the website that allows participants to share their real name, and (2) we have more whole genomes on the way! The Harvard Personal Genome Project has always emphasized that the genetic data our participants publicly share is “identifiable”. This means, even if you remove your name from the data, it’s possible for someone to determine your identity. Almost 4,000 people have enrolled knowing that privacy cannot be guaranteed, and many of them are proudly public about their data. However, to an outside viewer, the data looks anonymous! PGP Harvard’s profiles have random identifiers (huID numbers). Even for the staff, we’re often unsure whether a participant considers their name to be publicly associated with the profile or not. Sometimes participants do things that seem to indicate they believe their information is public by including their real name in an upload, uploading a photograph, or mentioning their participant ID in another forum. Until now there has been no way for a participant to explicitly choose to associate their name with their data on our website . In addition to providing the real names feature to PGP participants, we are also working on processing a new data set received from Complete Genomics, the company responsible for most of the sequencing done by PGP Harvard. This data comes from around 200 blood samples collected in the past year and a half, including the 2013 GET conference. At this point the most of these genomes have been sequenced and are waiting to be analyzed and approved. We hope to start releasing these to participants soon. Participants will have a 30- day period to review their data and decide whether or not to withdraw. For everyone that remains a participant, the data will then become public. We look forward to sharing this data and expanding our public resource! There are many participants that have publicly associated their names with their profiles, most notably the first ten participants in PGP Harvard (the “PGP-10”). However, these associations weren’t done within the participant website, but were done in other contexts (e.g. conferences, news articles, press releases, blog posts etc).